Aku bawakan cerita Bermuda Triangle ni selepas terlalu banyak conspiracy theories yg berjangkit-jangkit dalam social media berikutan kehilangan MH370 Penerbangan Malaysia yang masuk hari ni dah 5 hari hilang. Tiada kesan peninggalan yang boleh membawa pasukan penyelamat dan pakar-pakar merungkai misteri kehilangannya. Samada ia sudah musnah atau hilang di telan cerita ghaib semuanya menjadi satu persoalan serius yang tidak berpenghujung. Aku merasakan banyak theory ini di sebabkan kecenderungan manusia untuk mengkaji aspek supernatural atau perkara-perkara luar dimensi. Tidak boleh dipersalahkan masyarakat dunia yang bercakap tentang kehilangan pesawat ini. Kerana ia menjadi viral story yang meletup-letup sehingga ada orang yang tak kenal Malaysia sudah tahu di mana Malaysia. Semua syarikat akhbar dan berita menjadikan kisah ini satu trending news yang cuba mengeksplotasi minat pembaca dan pelanggan mereka. Theory science dan traditional methods berselangseli dijadikan satu kaedah untuk penghujahan dan kaedah kajian. Penggunaan alatan berteknologi tinggi untuk diuji menambahkan impact kepada urusan pencarian. Kuasa moden di sulam dengan kuasa kuno. Timbul pula golongan yang berpaksikan alam batin menggunakan kepakaran lapuk dengan bermacam kaedah cuba untuk menjadi golongan pertama yang merungkai misteri. Namun semuanya masih menjadi tandatanya selepas lima hari. The legend of the Bermuda Triangle probably started some time around 1945, when a squadron of five Navy Avenger airplanes disappeared on a training flight out of Fort Lauderdale, Fla. Soon, the masses were wondering: Was something amiss in the triangle-shaped stretch of ocean between Miami, Bermuda and Puerto Rico? Today, we’ve all heard of the Bermuda Triangle. And over the years, a whole host of theories, from the wacky to the reasonable, have cropped up to explain its disappearances. Look, no one likes to admit they make mistakes…but we all do it, and pilots and sailors are no exception. The Bermuda Triangle’s tropical weather and crystal blue water make it prime aviation stomping ground for everyone from veteran pilots to Navy sailors to amateurs looking to play around. There’s a lot of traffic in the area, and when you add in the turbulent weather patterns, swift currents and a landscape composed of a lot of similar-looking islands, it can be really easy to lose one’s way. Once you’re a little way off, it’s only a few more wrong turns until you’re really far askew: far, far away from a place to refuel or wait out tough weather. In short, you’re a disaster just waiting to happen … and, judging from the Triangle’s history, you’re not alone. This theory about crazy weather isn’t actually so crazy at all. The tropical skies over the Bermuda Triangle are prone to intense, severe storms as warm and cold air masses collide over the ocean. Seriously, it IS kind of smack in the middle of hurricane alley. Add to that the swift-moving Gulf Stream that cuts right through the Triangle, and you’ve got some very difficult territory for both ships and planes. To add another level of mystery to the legend, just take the underwater terrain: It’s rugged and deep, and is home to the Puerto Rico trench, the deepest point in the Atlantic Ocean. We’ve all heard myths about compasses in the Bermuda Triangle spinning wildly out of control. Legend has held that the Bermuda Triangle is one of only two places on the planet where a compass points true north, as opposed to the magnetic north. Now, navigators know that a compass must be calibrated to compensate for the deviation depending on the location on the globe. While the Bermuda Triangle was once, during the 19th century, a place where a compass pointed true north with no variation, the Earth’s magnetic field is constantly changing, and along with it, compass variations. These days, the Bermuda Triangle does not sit in any kind of strange magnetic area, and pilots and sailors know well to adjust their compasses to compensate for the variation, called declination, between magnetic north and true north. There are plenty of charts to help them out with that. For those of you who believe in the legendary underwater city of Atlantis, this one may actually hold some water (no pun intended). 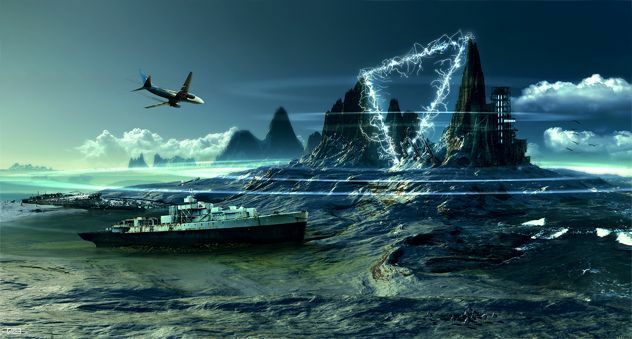 Those who believe Atlantis once lay deep beneath the Bermuda Triangle argue that the remnants of the intense energy crystals that were once used to fuel the city are now interfering with airplane and ship electronics, causing them to go haywire. Their proof? Sometime in 1970, a scuba-diving Atlantis proponent claims he found a mirrored pyramid of some type, deep under the Atlantic, somewhere around the Bahamas. Um …well, yeah, if he really did find that, then, sure, most likely something’s going on…but the guy seems to have forgotten his underwater camera, let us say. Other theorists have even more evidence, pointing to what they say is obvious, more easily seen evidence: the Bimini Road, a strange rock formation composed of uniform, seemingly sculpted towers of rock just of the coast of the Bahamian island of Bimini. The Atlantis proponents claim it was once a dock; geologists claim it’s the work of natural forces. Hmm…so, naturally occurring, interesting-to-look-at rock formation or underwater port? You be the judge. A downed spaceship lurking deep underwater, its dangerous alien mechanics interfering with our own technology? Perhaps. Or perhaps the Bermuda Triangle, along with another similarly rumored triangle in the Pacific off the coast of Japan, serves as a portal for interplanetary, interdimensional creatures. This particular myth holds that human ships and planes, when caught in the portal at the wrong time, end up trapped in between dimensions – it’s all just an unintentional by-product of your average day-to-day alien interplanetary, interdimensional, time portal transport. And you thought your commute was dangerous. They really are out to get us, aren’t they? And they’re so secretive about it. Forget Area 51; they call this base AUTEC (for Atlantic Undersea Test and Evaluation Center). It’s located on the Bahamas’ Andros Island, right in the middle of the Bermuda Triangle, and it’s where the Navy tests out subs, weapons and sonar…but some people think that’s not all they test out. A handful of theorists insist that our government has been working with extraterrestrials and that AUTEC is actually a testing ground for reverse-engineered alien technology. Might this advanced alien technology be powerful enough to down planes? So, this theory arises mostly from a single incident. 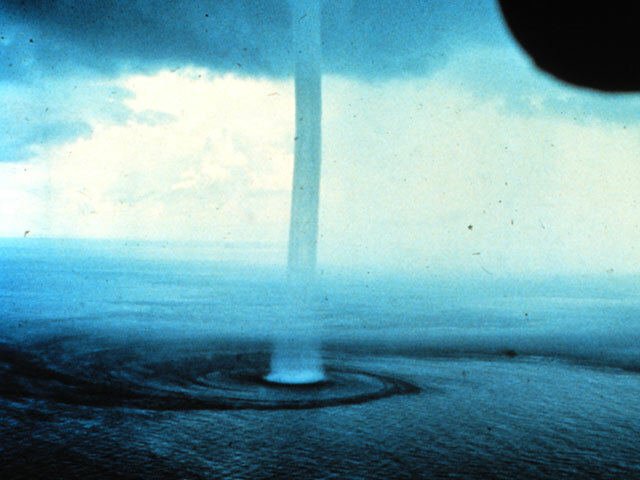 Here’s the story: In 1970, Floridian pilot Bruce Gernon and his father were en route from Andros Island to Bimini Island in the Bahamas when they came across a strange cloud that they say grew exponentially before morphing into a tunnel. Now, would you fly straight into a spinning, tunnel-shaped cloud? Gernon did. He flew into that rotating vortex, he says, only to emerge in a thick “electronic fog” with a white haze surrounding the plane. His compass spun wildly and electrical sparks surrounded him. When the fog finally broke up, Gernon says he found himself miles away from where he expected to be – and much farther than he could have traveled in that time, leading him to believe he had passed through a time travel tunnel. So, was the “fog” a natural occurrence? Was it due to UFOs, caused by interference from extraterrestrial technology? 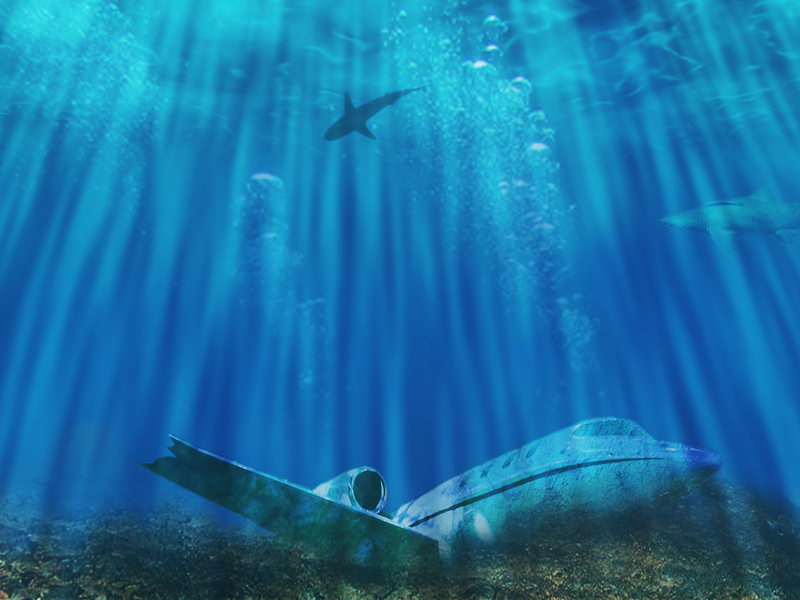 Deep beneath the surface of the Bermuda Triangle lie pockets of trapped methane gas, just waiting to be unlocked by seismic activity or underwater landslides. If unleashed, the theory goes, this methane gas could bubble to the surface, reducing the density of the water. Any ship in that patch of water would lose its buoyancy and sink perilously. It gets worse: In theory, if enough of the flammable gas bubbled up to the surface and got high, high, high up into the air, it could potentially stall an airplane engine or even be ignited by an engine’s spark. It’s important to note that the Bermuda Triangle is far from the only place on the planet where methane hydrates exist – it’s not even the area with the highest concentration – but it is possible that these hydrates could pose a threat. Now, would their eruption be powerful and forceful enough to sink a ship or down a plane? We’ll leave that one up to you. This region, just north of the Caribbean in the Atlantic Ocean, is totally pirate territory …um, remember Pirates of the Caribbean? We rest our case. But seriously, piracy really has been a consistent problem in the Triangle for hundreds of years. Now, stir in some good old-fashioned myths about supernatural phenomenon and it’s just that much easier for a wily pirate to get away with it (“Who? Me? Blame it on the ghosts…or the aliens.”). While piracy wouldn’t account for the aircraft disappearances, it might explain some of the ships that went missing over the years (and also, any treasure you might find buried on the ocean floor). 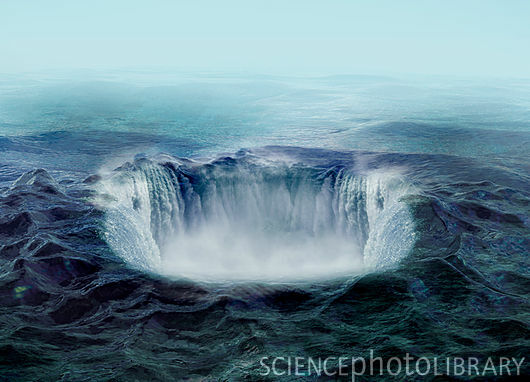 So, way, way, way back, 11,000 years ago, a comet may or may not have crashed to Earth and landed deep on the ocean floor, right beneath where the Bermuda Triangle lies today. Some theorists speculate that this comet might have strange electromagnetic properties that could disrupt compasses and other navigational tools and even interfere with an aircraft engine. So, has anyone found such a comet? No … or, well, not YET, but the ocean in the area can be tens of thousands of feet deep in some trenches, so proof may never be found. With no proof, faith in an ancient alien comet is really all that’s left. Mind reading power? Mind Reading Technology?